Budapest, Hungary: ISKCON Hungary has risen to the challenge of taking care of refugees who are moving to Europe from countries shaken by war, violence and conflict, such as Iraq, Afghanistan and Syria. 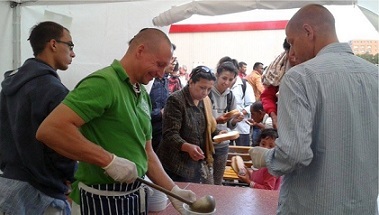 The devotees now distribute hundreds of plates of prasada, which is always being accepted with gratitude by the refugees, most of whom have not touched freshly cooked food for weeks. 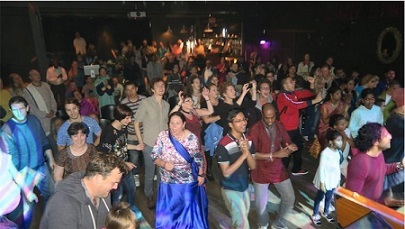 The Hare Krishna Festival tour that drew many Irish people to Krishna consciousness in the 1990s returned to the Emerald Isle this summer, and once again got Irish feet dancing. The festivals, held at halls in Dublin, Cork, Waterford, Sligo, and Belfast included bhajans, a drama, a video presentation, a talk on the basics of Bhagavad-gita philosophy, and a Bharata-natyam dance. Penang, Malaysia: The RM10 million, threestorey octagonal Sri Sri Radha-Krishna Temple of Devotion and Understanding in Seberang Jaya, Penang, is set to become a state landmark. 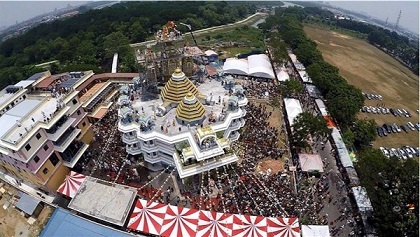 ISKCON national general secretary Simhesvara Dasa said the temple was modelled after India’s two famous temples – Jagannatha in Puri and Krishna-Balarama in Vrindavan. 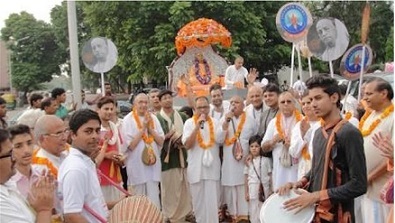 Chandigarh, Punjab: On August 13, thousands of people marched together in the city of Chandigarh, capital of Punjab and Haryana, while loudly performing kirtan and chanting the Hare Krishna mantra to usher in the yearlong celebrations commemorating the 50th anniversary of the International Society for Krishna Consciousness (ISKCON). New Delhi: Inspired by His Holiness Gopala Krishna Goswami Maharaja, Ajita Govinda Dasa has compiled a book named Values of Life. This is the third book in the series and is being taught in more than thirty schools across India. Thematically divided into twelve parts, each with multiple subsections, A Comprehensive Guide to Bhagavad-gita is unique in that it elucidates key Sanskrit terms in the original text by using the literal meaning of the Sanskrit words, thus allowing the text to define its own terms and make its own arguments. Special attention is given to categories such as knowledge, meditation, karma, devotion, sacrifice, renunciation, equality, and liberation. 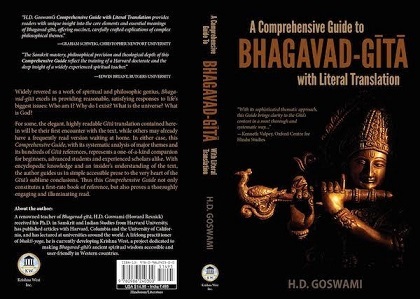 A Comprehensive Guide to Bhagavad-gita also includes a precise, literal translation of the ancient text. Kurukshetra, Haryana: ISKCON is now on track towards building its first temple in the historic town of Kurukshetra. 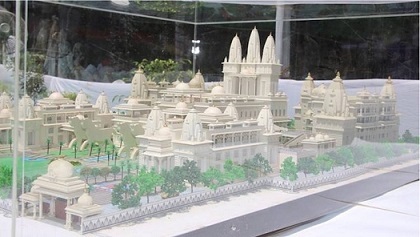 The future temple would be shaped as a chariot and would cover an area of six acres. Among other functions, the temple would house facilities for Bhagavad-gita studies, food distribution center, and gosala for cow protection. Takayama, Japan: Award-winning flutist Bhadra Rupa Dasa has been invited to perform a concert of Gaudiya Vaisnava songs, along with a presentation on Srila Prabhupada and ISKCON’s 50th anniversary, to 10,000 people at a shrine here. Bhadra Rupa, alias Luis De La Calle, is signed to Sony World Music, has performed at theaters around the world, and is a member of the US, British and Japanese national flute associations. At his music academy in Geneva, Switzerland, he teaches students how to play devotional songs by Vaisnava composers like Narottama Dasa thakura.